We’re gearing up for our largest event of the year – the Fort Myers Boat Show! With so much to see, learn and do, we want to make sure you feel as prepared as possible to get the most out of your boat show experience, no matter what show you’re at. Whether you’re there strictly for the boats, interested in discovering fishing tips from local anglers, or making your holiday wish list filled with the latest gadgets, you’ll want to make sure you aren’t leaving anything out. Whether you attend the show regularly or are planning your first visit, you can benefit from our tips below. Fort Myers, FL – Southwest Florida’s prime boating season is fast approaching and the Bonita Springs Boat Show, March 5-8 at the Naples Fort Myers Greyhound Track is the perfect chance to get ready. 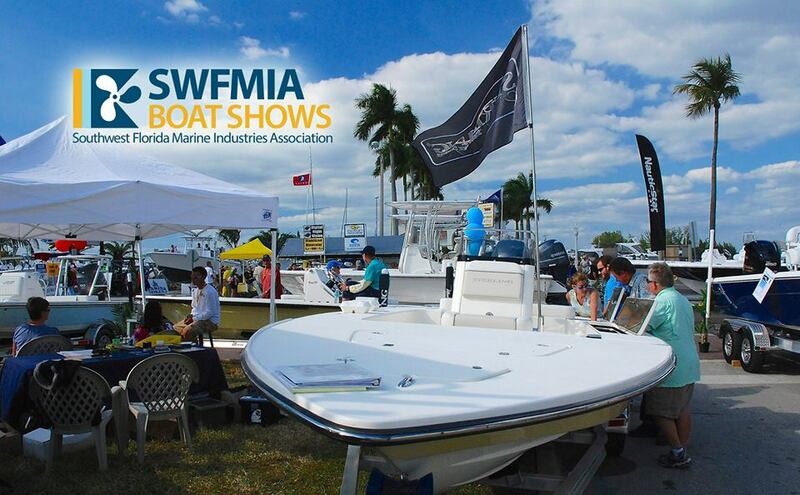 Southwest Florida Marine Industries Association’s 26th Annual springtime show offers a wide variety of boats and accessories. Nearly every major area dealer is on hand, representing almost 60 different boat lines. Just about every type of boat used in Southwest Florida up to about 35’ will be on display. A 180’ tent houses accessory displays. Everything from engines and electronics to boat lifts, to marine accessories to clothing and gifts items, to a wide variety of services. Fishin’ Frank and his crew will be conducting seminars throughout the four day show. Fishing guides and experts will be on hand to answer questions and just talk fishing. The U.S. Coast Guard and Power Squadron can answer questions about boat safety and visitors will find lots of information about where to go and how to enjoy Southwest Florida waters. Show hours are 10AM-6PM, Thursday – Saturday and 10AM – 5PM on Sunday. Admission is $8.00 (kids under 16 are free with paid adult admission). Parking is free. The Naples Fort Myers Greyhound Track is located at 10601 Bonita Beach Road SE Bonita Springs, FL 34135. For more information about the show and about boating in Southwest Florida, visit goboatingflorida.com or contact: Southwest Florida Marine Industries Association at 239-656-7083. PORT CHARLOTTE, FL – Charlotte County is home to just about the finest boating waters in the United States and The 14th Annual Charlotte County Boat Show is coming to the Charlotte County Fairgrounds, January 15th – 18th. This is the area’s largest showing of boats and marine products and a great chance to see what is new in 2015. Every major dealer will be on hand with more than 250 boats estimated to be on display. The Fairground’s Expo Hall will be loaded with a variety of marine accessories and services. There will be supplies and accessories, boat lifts, clothing, yacht brokers, marinas, boatyards, service suppliers and more. The show is a great opportunity to learn more about area boating and safety. The U.S Coast Guard Auxiliary, Power Squadron, and local Yacht Clubs can answer just about any questions you may have about where to go and how to enjoy the amazing boating waters of Charlotte Harbor. The ever popular Fishin’ Franks Bait & Tackle will hold Fishing Seminars throughout the four days. You can learn from and talk with area guides about both inshore and offshore fishing. You’ll never find a friendlier or more experienced crew than Fishin’ Frank’s team, always happy to answer all your questions. With Frank’s popular Fishing Simulator, you can experience the excitement of catching everything form a bass to a marlin. It’s all free. Just stop by the seminar area. Admission to the show is free. There is a $5.00 parking fee for very convenient on-site parking. The show is open from 10AM-6PM Thursday through Saturday and 10AM-5PM on Sunday. The Boat Show is located on the north end of Port Charlotte at the Charlotte County Fairgrounds. 2333 El Jobean Road (Route 776), Port Charlotte FL 33948. About 3 miles west of U.S. 41. Across the street from the Charlotte County Sports Complex (Spring Training site of the Tampa Bay Rays). The CHARLOTTE COUNTY BOAT SHOW is owned by the Southwest Florida Marine Industries Association. The association, whose membership includes virtually every boat dealer and marine related company in Southwest Florida, has protected the rights of boaters and promoted boating and the marine industry in Southwest Florida for more than 40 years. The association also owns the BONITA SPRINGS BOAT SHOW, held at the Naples Ft. Myers Greyhound Track in March and the FORT MYERS BOAT SHOW, held in downtown Fort Myers in November. Complete show details can be found at www.goboatingflorida.com. 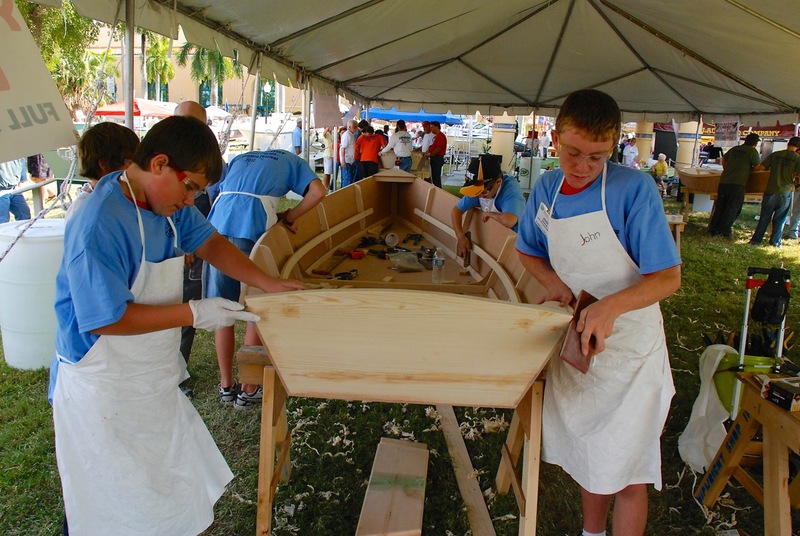 The 42nd Annual Fort Myers Boat Show Set to Make a Splash! Southwest Florida’s largest and most anticipated boat show returns for it’s 42nd annual exhibition of boats, equipment and seminars. The event will be held in the Harborside Event Center and the City of Fort Myers Yacht Basin Thursday, Nov. 13 through Sunday, Nov. 16. The show will be open from 10 a.m. to 6 p.m. Thursday through Saturday and 10 a.m. to 5 p.m. on Sunday. The Harborside Event Center will be filled to capacity with boats and marine accessories. A new accessory display area has also been added along Hendry Street facing the marina. This leads to the “Welcome to the Water” Boating Lifestyle area in the City Pier Building on the river. Fishing, Diving, Paddlesports, Boat Maintenance Tips and other boating how-to information will be on display inside and outside. Local fishing expert Fishin’ Frank will host a series of seminars covering techniques to catch many popular Gulf Coast species. Frank’s guides will be on hand throughout the show to offer advice on making the most of your fishing time on the water. The popular “Fishing Simulator” returns giving show visitors the chance to catch everything from bass to billfish. Saturday and Sunday, one of Florida’s top divers, Jim “Chiefy” Mathie will hold seminars on spear fishing and catching lobster. Mathie is the author of two books, “Catching the Spear-it” and “Catching the Bug” that offer detailed information on improving your diving skills. Boats however are still the show’s main draw. Every type of boat from kayaks and inflatables to yachts and everything in between. There will be more than 40 companies displaying boats, representing more than 90 boat lines, plus over 40 brokerage boats in-water. Food and beverages will be available inside the event as well as several new downtown restaurants. Admission is $10.00 per person, per day and free for children under 16 with a paid adult admission. Tickets can be purchased at the door. For more information about the show, click here. SWFMIA Spring Boat Show Moving To Bonita Springs. Fort Myers, FL – The Southwest Florida Marine Industries Association has relocated its 25th Annual Spring Boat Show, to the Naples Fort Myers Greyhound Track in Bonita Springs, March 6th -9th. Nearly all the area’s major dealers will be on hand with hundreds of boats on display. The show will feature a wide variety of booth displays with all kinds of marine accessories, and services. Port Charlotte’s “Fishin’ Frank” and his crew of experienced and entertaining guides will conduct fishing seminars all four days of the show. Frank’s new fishing simulator will give show visitors a chance to experience the excitement of fighting everything from bass to billfish. This is a great opportunity to see, compare and buy boats and accessories. Boat shows are always so appealing to the public because you can shop without driving all over Southwest Florida. But more than that, if you are new to the area or thinking about getting into boating, the show is a great learning experience. What do you want to do on the water? What kind of boat fits your budget? What about financing and insurance? What kind of accessories do you need? How about a boat lift? How can I learn about safe boat operation? Where are fun places to go on a boat? You can answer all those questions at the show. We’re even bringing our Caloosa Café & Pub that is such a hit at our November Show, featuring great food and all kinds of drinks. And, of course, the Greyhound Track and Poker Room will be in full operation throughout the show. For more information about the show and about boating in Southwest Florida, visit www.goboatingflorida.com or contact: The Southwest Florida Marine Industries Association. 239-656-7083. info@swfmia.com. So you think you can build a boat? Prove it! 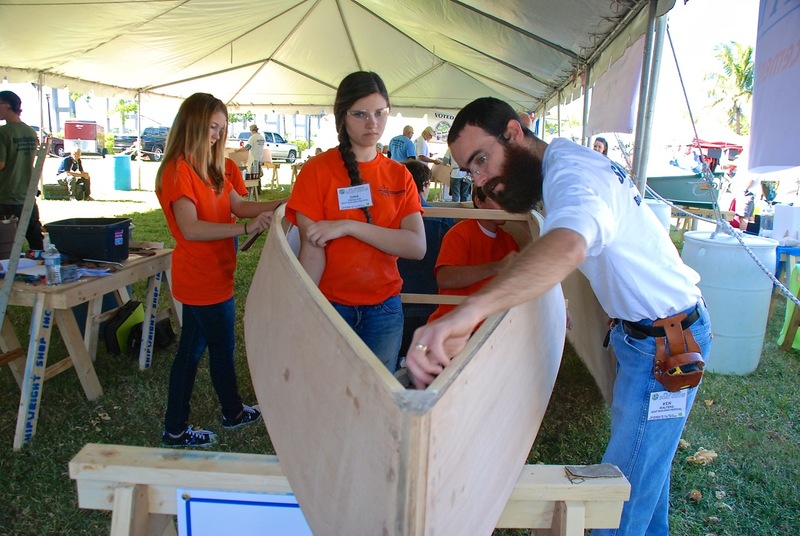 The 3rd Annual Southwest Florida Boat Building Festival is looking for teams to compete in this year’s event held during the Fort Myers Boat Show, November 14-17, downtown on the riverfront at Harborside Event Center. For a business, youth organization or even a family, this is a chance to learn almost forgotten skills, it’s a great team building experience and it’s a lot of fun. The Festival is the brainchild of David and Sharon Bickel of the Shipwright Shop in Ft. Myers. David, a fixture in the local marine community, is a true master ship’s carpenter (not many of those left!). He has a passion for woodworking and a passion to see his skills passed along to a younger generation. No experience is required. 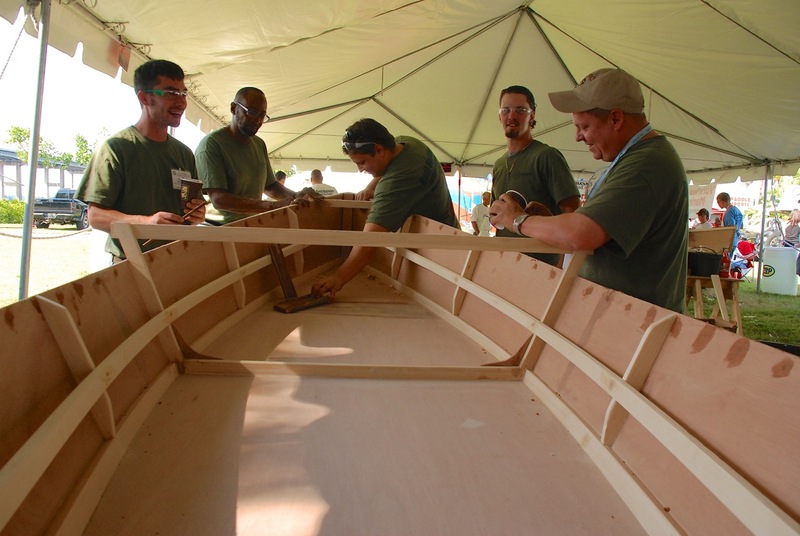 David and his team of experts supply all the materials and tools and work with all competitors over 2 ½ days as they each build their own wooden boat. If you are into boats and into working on them, this will be an experience you will never forget. The cost is $1,750.00 per team. And that’s cheap considering that on Sunday, you go home with your very own seaworthy wooden skiff! 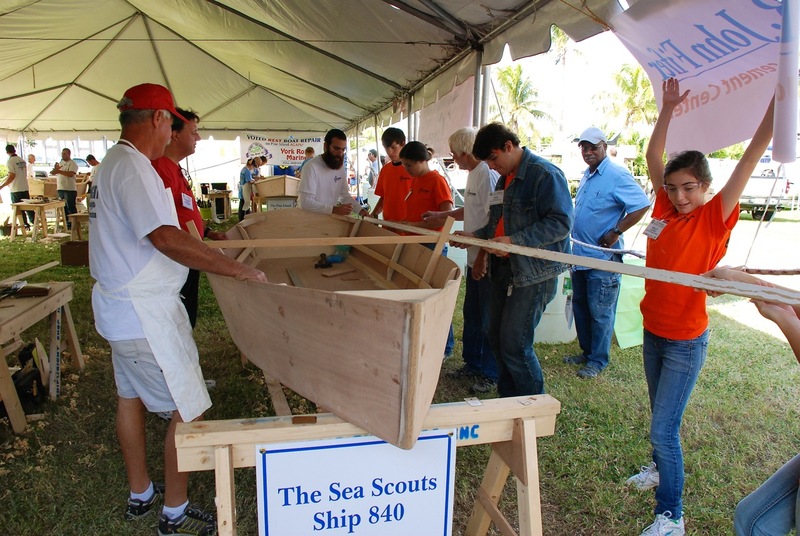 For organizations or businesses, there are all kinds of opportunities to use the skiff as a fund raiser. For a family, you’ll have a lifetime of memories and with a little TLC, a boat that will last as long as the memories.